No. 177. 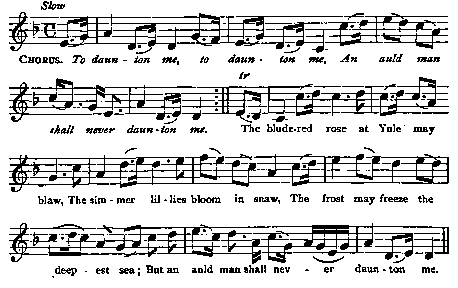 The blude-red rose at Yule may blaw. Tune : To daunton me. Cal. Pocket Companion, 1743, i. p. 16. ChorusTo daunton me, to daunton me, ) ,. The blude-red rose at Yule may blaw, The simmer lilies bloom in snaw, The frost may freeze the deepest sea, But an auld man shall never daunton me. To daunton me, and me sae young, Wi' his fause heart and flatt'ring tongue : That is the thing you ne'er shall see, For an auld man shall never daunton me. For a' his meal and a' his maut, For a' his fresh beef and his saut, For a' his gold and white monie, An auld man shall never daunton me. His gear may buy him kye and yowes, His gear may buy him glens and knowes ; But me he shall not buy nor fee, For an auld man shall never daunton me.